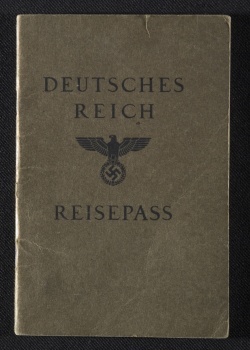 When Nazi Germany took over Austria in March 1938, Austrian citizens became German citizens and their old Austrian passports were no longer valid. 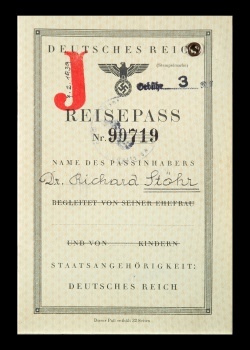 In order to travel (and more importantly in the case of Jews, in order to emigrate), one had to obtain a passport from the new Nazi government. 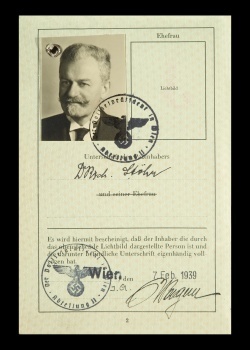 Below are the most interesting pages from Stöhr’s passport. 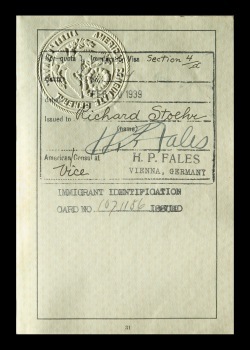 He used this document to emigrate to the US in February 1939. The famous orange “J” denoting “Jew” was an addition suggested by the Swiss government so that they could know, among the many people trying to leave Germany at that time, which were the Jews.